Like most of the family and friends that received the invite for a Plasticine & Unicorn party, you are probably laughing out loud right about now. But it worked, I promise you. We had the rainbow colours, inspired by Plasticine Softeez and the Unicorn fits in with the rainbow theme as well – there is your link! We had a family party last weekend and her friends over for fun with Plasticine yesterday. Lots of fun was had too and everyone loved their goody bags. Win! Plasticine Softeez sent us a fantastic party box (which you will be able to win for yourself in an upcoming competition), in this box there was everything from party bags, to table cloths, a ready made pass the parcel to game ideas. It was just what I needed and all I had to do was add the little extra touches. The first game we played was a 10 minute dance off, musical statues style, I thought it would be good to get them to burn their energy off to begin with as I knew we had some sitting down games to play. They danced it all out and then we they were ready to play pass the parcel. The pre-made pass the parcel was perfect. Enough layers for all of the children and little, healthy, snacks in each layer and the prize was a tub of Plasticine Softeez. After this game we took to the tables and each child was given a Plasticine square and they had 5 minutes to make the longest snake that they could. I thought the children would not carry out this task, but they did and they really loved it. All the children made such an effort to make the longest snakes, some even cried as the Plasticine wasn’t getting longer. It was great fun. We measured the snakes up against each other and there was a clear winner in red! Now we had the Plasticine out, we worked together to swap colours and we played “Guess what it is?”. Lots of animals and objects, made out of Plasticine, were on cards and the children had to make their very own version and the winner was the one who made theirs look like the card. The birthday girl won this with her amazing cupcake, I was very proud of her fabulous Plasticine modelling skills. After the Plasticine modelling fun the children each pulled a string on the Unicorn Piñata and all of the sweets fell onto the floor, it’s amazing how much fun a piñata can add to a party – the children loved it and we made sure they shared the sweeties out to all of the children too. In amongst these organised games there was a lot of free modelling and also colouring too, Plasticine had given us some colouring in sheets, there was a lot of things to do. I loved the Baker Ross Rainbow Unicorn gliders and I thought it would be fun to hide 8 of them around the house and ask the children to guess how many Unicorns there were. It was a great game, everyone had a turn and there was only 1 child who got it right, I was amazed! The ideas came from the rainbow colours that Plasticine is made from and unicorns, of course. I had seen “Una the Unicorn” cakes in the Asda newsletter and had my heart set on those. Nanny sourced them from the large Milton Keynes branch, which is a good hour drive from where we live – a lot of effort went into getting this theme right. 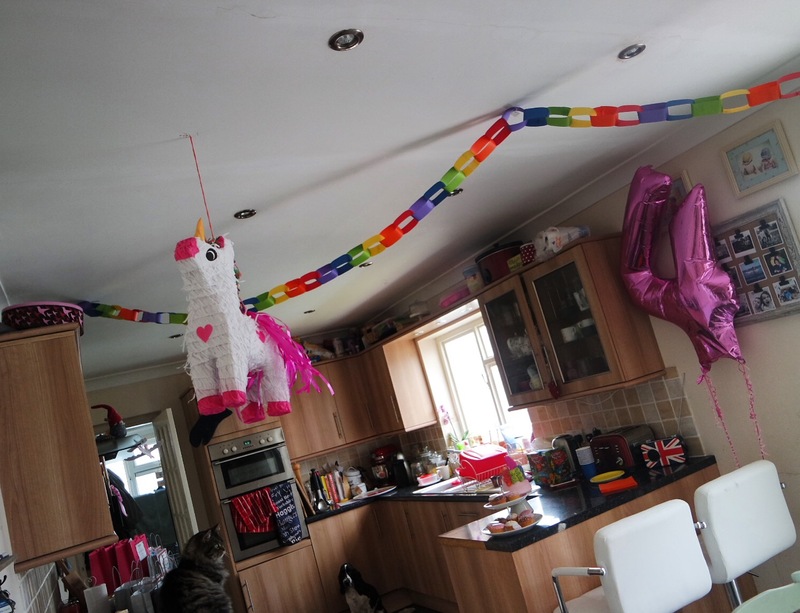 Next up on the list was the big 4 helium balloons and the Unicorn piñata, which I found on funkyparty.com, I discovered this by accident when I ordered Isla’s birthday card from funkypigeon.com and I was amazed. I had been looking for the Unicorn Piñata everywhere, it was either sold out or far too expensive. I got it next day delivery for the same price as the normal piñata. I liked this one too as it was a pull the string piñata, not a bash the piñata – I don’t want to encourage the children to bash things to get treats. I also managed to find rainbow coloured paper chains from funkyparty.com too, which again I had had trouble finding, I ordered three packs and spent an hour making paper chains – I quite enjoyed it and I think they looked really effective. The children liked making paper chains at Christmas time, so I thought it would be a good family activity. This was my favourite part and it took me nearly 90 minutes to make them all up, I made every effort to make sure the bags were full of lots of treats. Plasticine had sent the girls Shopkins blind bags and the boys World of Warriors toys, they each got a small square of Plasticine Softeez too. With the unicorn theme in full steam, we had bags of unicorn poo (rainbow coloured sweets in rainbow bags) and rainbow Unicorn gliders for each child too, of course. There was also lots of other goodies too, so the fun didn’t stop when they went home. Thank you Plasticine for sending Isla the fantastic party box, full of Plasticine Softeez goodies and party ideas. All opinions are my own.